This is Part 2 of my thoughts on the state of sea-level research. Here is Part 1. Fig. 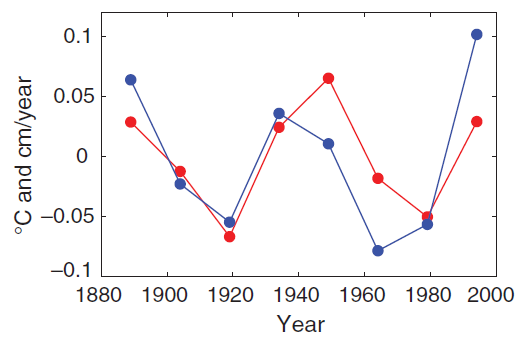 1: Fifteen-year averages of the global mean temperature (blue, °C, GISS data) and rate of sea level rise (red, cm/year, Church&white data), both detrended. This graph clearly shows a 60-year-period variation in the Church and White (2006) sea-level data, and it also shows the strong correlation of this with global temperature. (This of course is just another way of looking at the same data already shown in Fig. 3 of Part 1 of this post, and the fact that the data look like this is also the reason why the quadratic acceleration factor is small, as discussed in Part 1 and here). This correlation to me is evidence that the 60-year-variability is real (rather than a sampling artifact), because it suggests a simple physical mechanism for it: sea level tends to rise faster when it is warmer. That is the very idea behind semi-empirical sea-level models. Given the shape of the global temperature curve, semi-empirical models naturally predict this ~60-year “cycle” in global sea level. But is this a real periodic behaviour, i.e. a climatic oscillation? I don’t think so. The variation in global temperature shown above probably is not an oscillation: it is the familiar time evolution of global temperature that can largely be explained by the history of radiative forcing. E.g., the temperature plateau from 1940-1970 (which in the detrended data shown above is a downswing) is explained by aerosol cooling balancing greenhouse warming, while the following upswing is due to the then dominant increase in greenhouse gases. And if the sea-level history is a result of the temperature evolution, then the apparent sea-level “cycle” is also not an oscillation. At least not if you understand “oscillation” as a periodic behavior caused by a restoring force that drives the system back towards an equilibrium, which it then overshoots, so that the restoring force starts to work the other way, and so on. There is a simpler explanation: it looks like global temperature basically follows the forcing and global sea level follows the temperature, just as you would physically expect. So my interpretation of these data is: those two 60-year periods seen in the data may look like an oscillation, but they aren’t. Which has some consequences for prediction: an oscillation would suggest a coming downturn; if the system simply follows the forcing we’d expect the opposite. In 30 years time we will know for sure! Are process-based sea level models mature? My short and clear answer to this question is: No. I say this as someone who is a physicist and great believer in process-based modelling. And as someone who heads a department of about fifty scientists, almost all of whom are engaged in process-based modelling of various aspects of the climate system, many in ice sheet and ocean modelling with direct application to sea level. Have a look at our sea level pages to get an impression. In contrast, the semi-empirical sea-level modelling in my department is pursued only by one PhD student – it is a small sideline of our research. Ample reasons for my answer are found by looking at the large uncertainties and differences in process-based estimates of past contributions to sea level, which exceed a factor of three for glacier melt rates and even involve disagreements about the sign of Greenland mass changes (see Figs. 2 and 3 in Gregory et al. 2012). Two more reasons: only last year the effect of increasing snow fall on ice discharge from Antarctica was included in a model, and it was found that this cancels out about half of the additional snow fall and is the dominant reason for increased ice discharge (Winkelmann et al., Nature 2012). So a first-order, even dominant, mechanism is only now being implemented in ice sheet models. And likewise last year, it was shown (I think convincingly) that the temperature threshold for a complete loss of the Greenland ice sheet is probably far lower (by about a factor of two) than previously estimated (Robinson et al., Nature Climate Change 2012). A factor-two revision and a newly discovered first-order mechanism are both not exactly signs of a mature stage of modelling having been reached. I know enough about modelling the Greenland and Antarctic ice sheets and mountain glaciers to be certain that a lot of work remains to be done before these models can be called mature. Here I have put forth a different viewpoint to that of Gregory et al. 2012: process models have improved and now underpredict the 20th Century sea-level rise to a lesser extent than they used to. As a consequence they also predict a much greater sea-level rise for the future, vindicating the semi-empirical models which suggested that earlier projections were too low. However, process models are still not mature, and they still fall short of predicting the full extent of 20th Century sea-level rise, so the budget is not yet satisfactorily closed. I think the expert elicitation or the NOAA scenario document discussed in Part 1 of this post suggest that many experts share this viewpoint. Such differing viewpoints are a normal and important part of the scientific discourse – this is all a good and healthy discussion that I enjoy and that will continue to improve our understanding. Despite the large overlap between the authors of Gregory et al and the IPCC sea-level chapter, I trust that after the review process the IPCC will provide a balanced account. The recent improvements in understanding have confirmed the concerns of many sea-level experts, namely that the 4th IPCC report has understated the risks of future sea-level rise because the projection models used were not mature. In the meta-literature about scientific assessments, this IPCC sea-level problem has become a poster child for a poor handling of structural uncertainty, see e.g. Oppenheimer et al. (2007), O'Reilly et al. (2012) or Brysse et al. (2012), also when compared to assessments of other problems like ozone depletion O'Reilly et al. (2011). Structural uncertainty comes from the uncertainty about the structure of models – e.g. resulting from having models that don’t properly include all relevant processes, or from not knowing what the best models are. The 4th IPCC report did not do a good job at communicating the full uncertainty about sea-level rise, because the prime uncertainty range communicated to the public (the famous 18-59 cm rise by 2100) did not include the existing major structural uncertainty. Although the IPCC included caveats to say their range was not the full story, it failed to provide an estimate of the broader uncertainty, leaving e.g. coastal planners out on their own about how to take risk management decisions. Let us hope the IPCC learns from its mistakes and this time properly communicates a more encompassing and realistic range of uncertainty, based on the full suite of modelling approaches and all available information. A good example for how to do this is the sea level scenarios for the US National Climate Assessment. However, process models are still not mature,…. Another way to put it is that the durability of current ice sheets under 450 + CO2 is unknown. In Oceanography circles there does seem to be a considerable amount of credence afforded to the idea of an underlying 60-year cycle in sea level change. Is there much evidence to indicate the existence of such a periodicity beyond the historical record? Otherwise it seems like a shaky foundation. As a hypothetical, would it seem reasonable for the writers of a report to suggest that the increased SLR rate over the past 20 years is likely a function of this multi-decadal oscillation and not an acceleration in a secular trend, albeit in another section qualify this attribution with the words ‘in part’. Hypothetically speaking. > In 30 years time we will know for sure! Argh. That’s what they promised about my flying car and fusion power, and fifty years later all I got is this hang glider and solar panel….. Please leave the words ‘period’ and ‘cyclic’ for those phenomena which have high predictability. For example, astronomical cycles. Use ‘quasiperiodic’ for those phenomena with minimal predictability, such as ENSO. Otherwise, it is just an oscillation. Thank you for your frank assessment of the state of the field. Presumably, then, you would agree with Alley that a “sudden” slr of 3 meters cannot be ruled out? in conversation, I want to reach for a stick. Writing, somehow, lessens the smell of it. The odd case of it is funny, but, ow! Even for fairies in the garden, a future case can’t be “ruled out — it’s a trick question, it’s a trick! The question I posed is a simple one. I meant no ‘trick’ by it. Hank and anyone else are free to whack me with whatever ‘sticks’ they have at hand. I will continue to ask impertinent questions to the best minds on the planet about what they honestly think our likely futures may be. I guess I kind of thought that this was the whole point of having such a blog as this. If so, I fully expect the mods to inform me of such, or to out and out ban me and those like me, so that we don’t continue to distract from the true mission here, whatever that may be. I think your question to Stefan about Alley is fair enough. At the other post Eric Steig views Pfeffer’s estimate of 2m in 2100 as the (current) upper plausible boundary. Does Stefan think so to? In addition: what would be the upper plausible boundary for the rate of SLR in the coming centuries? And for how long could that rate be sustained? So what would be the current plausible upper boundaries for total SLR in 2200 and 2300? Meehl et al 2012 seem to estimate about 6 and 12 m respectively. And what rate of SLR would make adaptation technically or economically unlikely? In 2006 the German WBGU (Rahmstorf, Schellnhuber) advised 5 cm/decade and 1 m max as upper safe limit for SLR? They estimated up to 5 m possible in 2300 for 560 ppm CO2e (450 ppm CO2 alone) and 3 C in 2100. That would maybe imply the possiblity of up to 10m with BAU in 2300 and 2m in 2100, and a rate of max 40 cm/decade, sustained for about 2 centuries? What do Stefan and others think about this estimate now, in view of the new estimates that have come out over the past few years? It is very very good. Do watch it. It’ll vary by location and affluence. The task is how to turn seashore property into shallow water productive fisheries — and accomplish this before the mean water level covers them. First, remove all the crap currently under water — layers of trash, tributyl tin and other toxics. Then start clearing the coastline that’s going to be submerged in a century or two — lead paint, all the underground pipes and tanks, all the plastics, all the debris …. and lay down a base suitable for netting, or lobster traps, or racks for oysters to develop on. On the rocky coasts of Maine, doable. On the flat slope coasts of Texas and Bangladesh, maybe not. Hank and anyone else are free to whack me with whatever ‘sticks’ they have at hand. Our staunch Hank is admirably alert for hiJAQers here, the more effectively to counter them. Perhaps he can be forgiven the occasional type 1 error? Layman here. Most of these discussions focus on the disgorging of ice and sub-surface melting of grounded ice (e.g. W Antarctica). What about simple surface runoff? I tried some back-of-the-envelope using googled stats for area extents, and came up with roughly a 1:23 ration between ice sheet and ocean. With the crude assumptions…. … 23m would have to melt off the surface of the ice sheets to raise the oceans by 1m. At first that seemed like a lot, but – child of the frozen north that I am – I started thinking about how large ice or snow piles seem to melt, gradually melting-refreezing-melting-refreezing until the pores are filled and the energy content comes closer and closer to a rapid phase-change for the whole pile. Sure… 23m from the coldest darkest parts of the ice are unlikely. But I’d like to learn more about the state of the science regarding liquid water runoff. It is primarily Greenland that will contribute to SLR by surface melt, as Antarctica is mostly too cold. To what extent is this extra cause for worrying? Agreed. Antarctica is unlikely to have a significant effect on sea levels either way. Mountain glaciers will likely contribute similarly to the previous century, this is due to diminishing returns, as many glaciers have already lost more than half their mass. That leaves Greenland as the big wildcard. SLR will likely remain at current rates without a significant contribution from the GIS. It is quite possible (and maybe even likely) that Antarctica will have highly significant effects on sea levels in the present century, not via surface melt, but by accelerated calving due to the loss of buttressing ice shelves. Now, as I understand, the largest part (2/3 if I am correct to quote from the memory) of the sea level rise comes from the thermal expansion. And the relationship is linear between the temperature and volume, not between the temperature and time derivative of the volume. Thus I fail to understand the “simple physical mechanism” you postulate. In fact the strong correlation between the ratio of the sea level changes (detrended) and the temperature anomaly (also detrended) might be a result of some causal link with a third variable. I can imagine the rate of melting would depend on the temerature, giving rise to the observed relationship. But is so, then why is the contribution of the thermal expansion not visible? On a different note: I do not know your intentions when you wrote ” an oscillation would suggest a coming downturn; if the system simply follows the forcing we’d expect the opposite. In 30 years time we will know for sure!”. Was it sarcasm? To me such statement is valid on the face level: yes, the observations are the crucial decision factor, not models (however nice and beautiful the models are). Thanks for the replies; I follow Joe Romm’s blog but somehow missed the DarkCarbonProject; I wonder how many congressional fact-finding missions would finance that research? I’ll look at the paper mentioned. Given earth’s internal heat, is the WAIS receiving any appreciable warming from below? Is the answer different at the deepest grounding below sea level vs highest (geologic) altitude, or at the margins vs the center of the WAIS? Is this series periodic or quasi-periodic? If you think “Yes,” then predict the 11th y value in the series +/-1. If you predicted 4, you are right. The y values of each ordered pair are the digits in the Napierian base of natural logarithms, e. This of course cannot be periodic, as it is a transcendental number. Be very careful when positing periodicity. Humans tend to be able to pick out 10 out of 5 periodic systems. Average sea level is not the problem. Storm tides are the problem. Any society that has adapted to, or mitigated 3 meter storm tides can deal with 3 mm /year average sea level rise. Long before average sea level claims a new section of the water front, there will have been a long series of increasingly high and frequent storm tides. Before we get to a meter of SLR, we will have experience with the giant storm tides caused by 30 cm of SLR. Before we get to those giant storm tides we will have experience with Sandy’s big sisters producing large storm tides with sea levels only a few cm above current sea level. Now is the time address of sea level rise as imminent events rather than as some distant average. If we can deal with storm tide events, then we can deal with average sea level rise. If we look at NYC and Hong Kong in 2012, then we have to be thinking in terms of sea level rise events in the near future of ~ 4 meters. That is expensive engineering and construction that is needed now. This makes it clear that real capital expenditures to stop global warming are worth while. Being a true expert on cycles and cycling, the very fameous physical science musical acoustician and musical design instrument maker, also experienced with amateur radio “pitate” oscillators and exotic resonant receivers, I do find those Cyclists rather dilettantic. What about a rumble and what about a mess, what about a disaster and a chaos, and what about the sea dragon or serpent? Who is mostly the more natural and fruitful theory. Why that classic mechanical cycle? why not discuss a storm in a water- glass? Secondly, I don`t like coalsmoke. However, there may be a “Cycle” in it, an artificial one. Wirtschaftswunder 1 lasting from 1948 to 1978, avd Wirtschaftswunder 2 from 1998 and onward. Being a chemist, that is rather what I believe. > Wirtschaftswunder 2 from 1998 and onward. @19 (myself); Context for my question is all about the R-factor of the ice sheet, earth’s internal heat, and latent heat. To my layman’s way of thinking, and watching the snowpiles melt outside my window, an ice sheet whose base is ultra cold will have a very different behavior in our anthro-climate than one with a base that is warmed to -1C due to earth’s internal heat. From a sea-level rise point of view, all BTUs that are gained brings the whole heap closer to phase- change. When I go in caves around my town, temps are in the 50F range. How deep do you have to go into the sub-glacial bedrock to start warming up? Or is it the other way around… how far up in the glacial mass do you have to go to get away from earth’s warming effect? I’m guessing we haven’t bored the holes with the right technology to answer these questions. Mark E @25 — That is a fairly straightforward heat flow question. The thermal conductivity of ice and rock is known. Heat transfer through the Earth is slow; heat transfer by air and water circulation is rapid. The borehole studies (extensively) document that. Moulin formation and subsequent water flows represents very rapid heat advection through ice that is not considered in the bore hole studies. Nor do most borehole studies address the issue of latent heat in the local atmospheric temperature, and how that affects surface melt and water formation.